The project began with a conversation between Macy Blackman and Allen Toussaint shortly before the latter’s death in 2015. 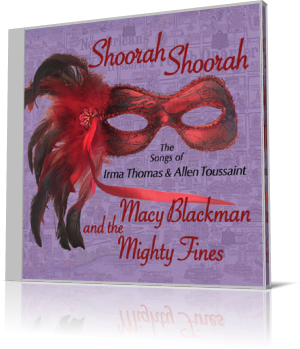 In tribute to Toussaint and his longtime partner, Irma Thomas, Macy Blackman and the Mighty Fines present Shoorah Shoorah: The Songs of Irma Thomas and Allen Toussaint. The band delivers a playful, sassy take on “Working in the Coal Mine.” The piece is accented by the drum shuffle, the saxophones and Nathan’s bass line. Blackman sings lead. Wright leads “Take a Look,” a charming ballad that mostly features her voice and the piano. She also delivers a complementary tenor solo. Her style is like a combination of Dionne Warwick and Aretha Franklin. 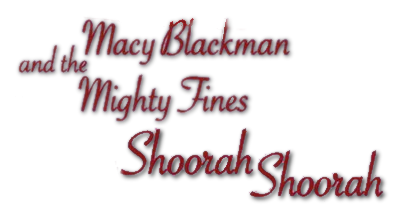 For his part, Blackman sings like a gruff version of Brooke Benton. And at times, he sounds flat. But despite this, he brings enough passion, verve and a sense of joy to overcome any negatives. With one exception, the album consists of songs written by Toussaint. Blackman and his bandmates take the New Orleans sounds of Toussaint and Thomas and turn them into a soulful, fun-filled party with friends. Blackman was born in Wilmington, Delaware, in 1948. During his high school years, he began as a sideman to some R&B bands. He would go on to back up such popular acts as The Drifters and The Coasters.